An award- winning garden designer and consultant. 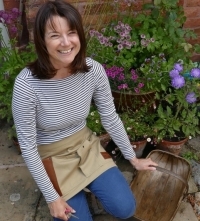 I work as a freelance stylist and contribute to mainstream magazines along with a regular column at Houzz Uk giving advice and tips to gardeners. I have my own blog, an online shop for hand selected garden items and am very active on Facebook, Twitter and especially on Instagram. I have a passion for Ponds especially natural ones and creating wildlife habitats. I love visiting new places, walking, foraging , photography, nature and animals and tea shops! I have a love of natural hand made products especially made out of wood and seek out artisan to make unusual garden products. I love anything to do with water especially if it is creating wildlife ponds.